Dash Notary is proud to say we are GLBA compliant! · Information we receive from others in your transaction. We may disclose any of the above information that we collect about our customers or former customers to our affiliates or to non-affiliated third parties as permitted by federal and state law. Pursuant to Title V of the Gramm-Leach-Bliley Act, you may “opt out” of the dissemination of any nonpublic personal information. 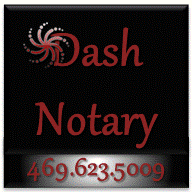 In order to opt out you should contact a Dash Notary at info@DashNotary.com and indicate the information you do not want disclosed.